Will the Incoming LIght Transform the Lower Noosphere, so That Weather Patterns Become More Life-Sustaining? Link: “What’s Up in Space, Friday, Sep. 28, 2018” at Space Weather, http://www.spaceweather.com/archive.php?view=1&day=28&month=09&year=2018 ..
NASA has a TIMED satellite that monitors how hot carbon dioxide and nitric acid gases are in the portion of the Thermosphere 100-300 km above Earth. The Space Weather article mentions that the Earth’s ‘thermosphere’ is cooling. 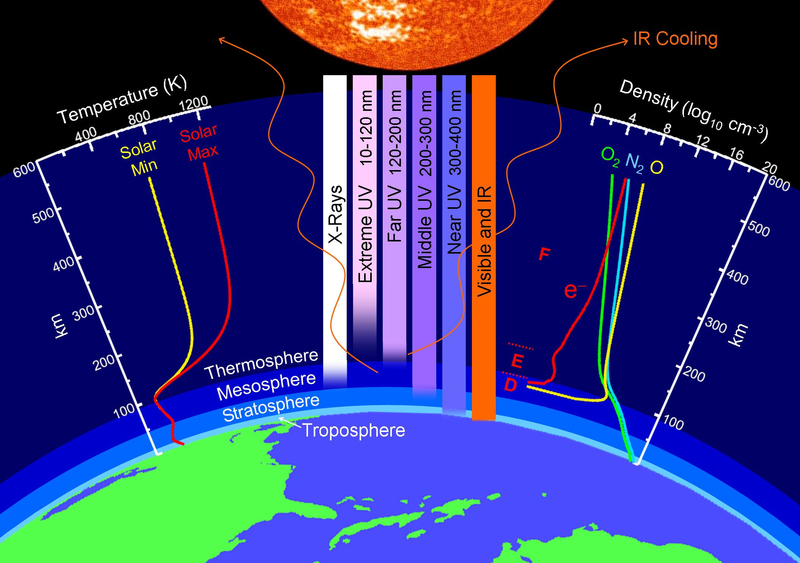 Here is a graphic from the article showing how vast the Thermosphere is, compared to the Mesosphere, Stratosphere, and Troposphere above which it lies .. Image: Earth’s Atmosphere, http://www.spaceweather.com/images2018/27sep18/layers.jpg .. 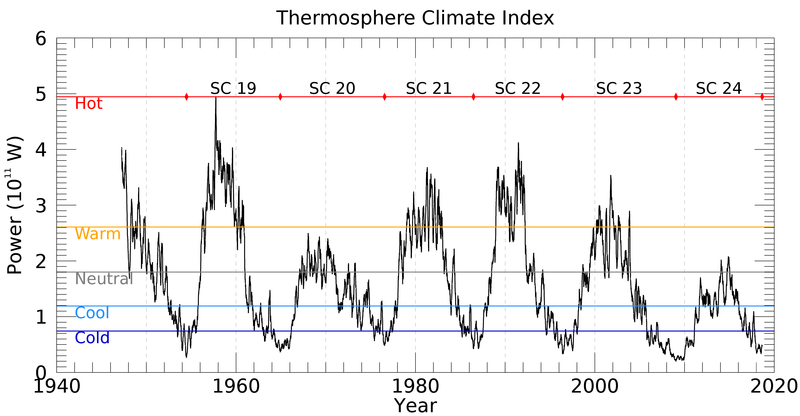 Image: Thermosphere Climate Index, from about 1950 to 2018, http://www.spaceweather.com/images2018/27sep18/tci.png ..
Link: “Thermosphere climate indexes: Percentile ranges and adjectival descriptors,” by Martin G. Mlynczak, Linda A. Hunt, James M. Russell, and B. Thomas Marshall, Received 23 February 2018, Revised 3 April 2018, Accepted 7 April 2018, Available online 9 April 2018. https://doi.org/10.1016/j.jastp.2018.04.004 … https://www.sciencedirect.com/science/article/pii/S1364682618301354?via%3Dihub .. This article describes a set of new solar terrestrial indexes (!) called the Thermosphere Climate Indexes (TCI). The descriptors for these TCI are: Hot, Warm, Neutral, Cool, Cold … Fluctuations in the TCI have to do with our Sun’s irradiance and our Earth’s geomagnetism. The article states that the Solar Minimum we are now experiencing has been the Coldest of the last 7 Solar Cycles. And this, no doubt, has to do with how very ‘minimalist’ the current solar minimum has been, in terms of sun spots Ifor more on this, see the Space Weather link above). Link: “Thermosphere,” in Environmental Organic Chemistry for Engineers, 2017 … search the subheading “Chemicals and Environment,” by Dr.James G. Speight, in Environmental Organic Chemistry for Engineers, 2017 … https://www.sciencedirect.com/topics/earth-and-planetary-sciences/thermosphere .. This link gives the height of the Thermosphere as from 79 km to a minimum of 488 km above Earth’s surface. At this link it is explained that the Thermosphere heats up because of solar activity. This most likely would explain why the link indicates the height of the Thermosphere may more than double, from 488 km to 1006 km. This would sync with a statement in the Space Weather article (see above) that the Thermospheric layer of the atmosphere shrinks when cool and expands when warmer. So then, during Solar Minimum, the outer edge of the Thermosphere may be about 488 km above Earth’s surface, and at Solar Maximum it may be at 1006 km above Earth’s surface, or thereabouts. Above the top boundary of the Thermosphere is the ‘Thermopause’, which is also termed the ‘Exobase’ of the ‘Exosphere’ … I take this to mean that the Thermopause is the boundary between Earth’s atmosphere and Outer Space. At the “Thermosphere” link I discovered that there is a current from North to South (termed ‘meridional’ circulation). There is also a rising motion near the Equator, and a sinking motion at higher latitudes. Because of Earth’s rotation there are flows from west to east (termed ‘zonal’ flows) in non Equatorial regions. Earth’s orthographic (i.e., ‘mountainous’) features and cloud formation (by which apparently is meant the cooling effect of rain?) perturb the zonal flows. This may mean they have a ‘roiling’ effect? From the same link, I get that Earth’s ionosphere includes, and also expands beyond, the Thermosphere during daytime, and then then shrinks upward to include mostly only the Thermosphere at night. Ionization in the Ionosphere accounts for auroras that are seen at the Poles at night. … then might not the Noosphere … the Collective Mind of Earth … be interdimensionally colocational, in its Collective Superconscious portion, with the Thermosphere of Earth? Might what SpaceWeatherNews … https://spaceweathernews.com/space-weather-health-alert-information/ … terms ‘cognitive diminution’ and what Tom Kenyon … www.tomkenyon.com … terms ‘cognitive dissonance’ be the effects felt in the Subconscious and Conscious portions of the Collective Mind of Earth’s Noosphere, while the Solar energies and Earth energies are transforming the Superconscious portion of the Noosphere, overlaying and interpenetrating, as might be envisioned, the physical ions of the Thermosphere? … keeping in mind that our Sun is interacting with many other Suns, especially those in the Paths of Light … sometimes open to, and sometimes closed to … the Light of the Great Central Sun. Link: “The Universe as Intelligent Love and Light,” by Alice B. Clagett, originally published on 17 January 2014 , https://wp.me/p2Rkym-7A2 ..
Link: “Mystical Poetry Celebration in Los Angeles,” by Alice B. Clagett, originally published on 23 August 2014, https://wp.me/p2Rkym-7k3 ..
… then the changes taking place in our Thermosphere, which we perceive as ‘cognitive diminution’ or ‘cognitive dissonance’ in Mini-Noospheric Terms (in terms of personal cognition) … are but veiled perceptions of this greater Truth. This Troposphere may be conceived as interdimensionally colocational with the Collective Subconscious and the Collective Conscious of Earth’s Noosphere. What we term the Troposphere … the ‘sphere of change’ … is densely affected by weather turbulence … clouds, storms, droughts, and winds. These weather patterns in Earth’s physical atmosphere seem chaotic, and beyond our control, because they coincide, in Noospheric terms, with our Collective Subconscious of humankind. As the Incoming Light transforms the Collective Superconscious, with concomitant roiling of the Thermosphere, may not the Collective Subconscious of Earth’s noosphere be transformed to greater Consciousness, to awareness, so that it matches the Consciousness of Awakened Earth? Should this transformation take place, as thought to be occurring by Ascensioneers, then we might anticipate that Earth’s Troposphere will become less the ‘sphere of change’, and more a conscious manifestation of nonrandom weather patterns attuned to the needs of all the beings on Earth. This entry was posted in 09 – Monadic aspect (Awareness), 3rd Dimension, 4th Dimension, Anxiety - fear - panic attacks - fight or flight - cognitive dissonance - mental turmoil, Astrogeophysics - EMF - hologram, Chaos theory - butterfly effect, Dimensions - multidimensionality - veils, Enlightenment - satori - awakening - illumination - rapture - self-realization, Incoming light - grace - leveling up, Lightworkers - gatekeepers - pathfinders - starseed - wayshowers, Mastery of mind - subconscious - unconscious mind, Solar events - geostorms, Unconscious thought cloud of the world - noosphere, Weather and space weather, ZZ- Awakening with Planet Earth and tagged 'Exobase, astrogeophysics, Atmosphere, awareness, chaos systems, chaos theory, cognitive diminution, cognitive dissonance, collective conscious, collective subconscious, Collective Superconscious, dimensions, Exosphere, fourth dimension, incoming light, intelligent Light, lightworkers, mastery of mind, Mesosphere, multidimensionality, NASA, noosphere, solar cycles, solar events, solar minimum, space weather, Stratosphere, subconscious, TCI, Thermopause, thermosphere, Thermosphere Climate Indexes, third dimension, TIMED satellite, transformation, Troposphere, unconscious, unconscious thought cloud of the world, weather on 28 September 2018 by Alice B. Clagett.